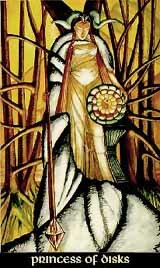 The Princess of Disks represents the Earth in the Earth, thus she is the pure manifestation of the qualities of Assiah, the physical world of making and growing. She is the last of the court cards and therefore implies a new begin of the circle, which could mean the beginning of a new prject or a new physical creation. The Princess of Disks is warm-hearted, sensual and generous, an unwavering and concentrated person with all the reliable stability of the Earth. Yet she lacks Fire and Air, as well as the conforming qualities of Water, she can easily be a little too dependent from outside influences but nevertheless being unable to really adapt to others. On the dark side the Princess of Disks can get illogical, prodigal and wasteful, dissipating her ideas and lacking the ability to recognize facts. When in bad mood, she's as adaptable as a stubborn, nasty child.